Chris began his career in the electrical business at 17, making deliveries and picking orders for a regional lighting distributor. Chris studied at Douglas College in New Westminster and earned a Diploma in Business Management. He joined EECOL Electric in Calgary in 2000, and held many positions over the next 7 years, spanning residential, commercial, industrial, OEM & utility sales and management. In 2007, an opportunity to work with his father Keith, at the agency he founded – Adanac Sales – was too good to pass up, and spent the next 7 years as an outside salesman, specializing in residential control systems, travelling all territories in British Columbia. 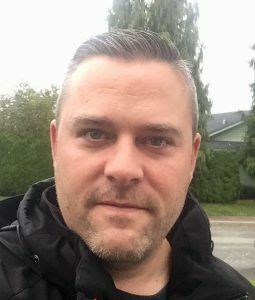 Cascadia Sales was founded In 2012 as Chris, alongside his brother Ryan and father Keith, opened a new electrical rep firm based in Maple Ridge, British Columbia. Upon his fathers sudden passing in 2018, Chris took over as company President. Since 2007 Chris has lived in Maple Ridge, British Columbia with his wife Shannon, and two sons Bradley and Kieran who all enjoy hiking, biking, camping and fishing all over British Columbia.